The wood and native stone Concert Pavilion, located in beautiful Waterfront Park, was completed in 2014. The cost was $650,000, and funds for it were provided by an anonymous donor. Ziese Construction was the contractor. ​The pavilion is used for free movies and concerts on a regular basis during the summer. 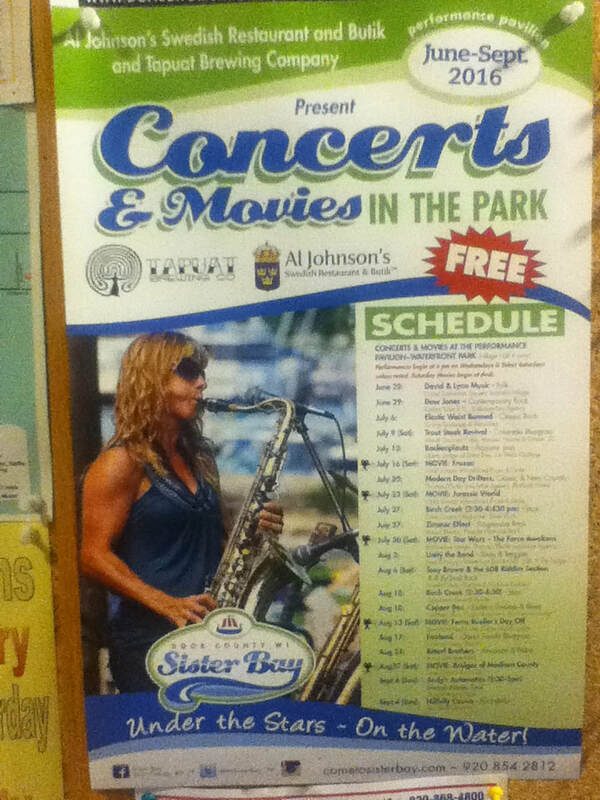 The Sister Bay Advancement Association (SBAA) has sponsored these events. On festival weekends, band performances also are featured. ​ Waterfront Park is centrally located in downtown Sister Bay on the shores of Green Bay. It has more than 1,900 continuous feet of water front with 600 feet of a sand beach. It has been dubbed the "Best Playground in Door County". Not only is the concert pavilion there, but there is a gazebo/bandstand (which formerly hosted concerts), picnic areas, beach, and a "quiet craft" launch. It is the largest public waterfront property in northern Door County.